Tailoring experiences for customers is critical to make your business standout. Customization works well for organizations that want to enhance their standard customer experience but don’t have the necessary tools or strategy for in-depth personalization. 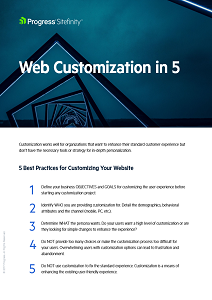 Learn about the 5 best practices for customizing websites and the 5 biggest challenges marketers face while customizing their websites.